A still from the upcoming "Ultimate Spider-Man" cartoon. He’s been Amazing, Spectacular and Unlimited, but the nerdiest hero in comics is going Ultimate for a return to cartoon form. “Ultimate Spider-Man” premieres Sunday, April 1 (11 a.m. EST), leading Marvel’s new programming block on Disney XD. The lineup includes new animated shorts and the second season of “The Avengers: Earth’s Mightiest Heroes,” as well as a real-life look at the art and science of superheroes. It’s not just a Marvel thing. In March, DC Nation launched its own programming block on Cartoon Network. Along with the “Young Justice” and “Green Lantern” cartoons, there are lighthearted short films done in a variety of animation styles, including claymation. With “The Amazing Spider-Man” live-action film coming to theaters this summer, Peter Parker is having a big year on screens large and small. “Ultimate Spider-Man” takes its name from the long-running comic book series by writer Brian Michael Bendis, who has written every issue since it debuted in 2000 and serves as the series’ consulting producer/writer. Peter Parker, voiced by Drake Bell, even sports a hairdo similar to the one created by original comic book artist Mark Bagley. The comic currently goes by the name “Ultimate Comics Spider-Man,” in which a new character named Miles Morales has taken up the mantle following Peter Parker’s controversial death last year. The character has had several cartoon incarnations over the past four decades, most recently in “The Spectacular Spider-Man” animated series that ran from 2008 to 2009. 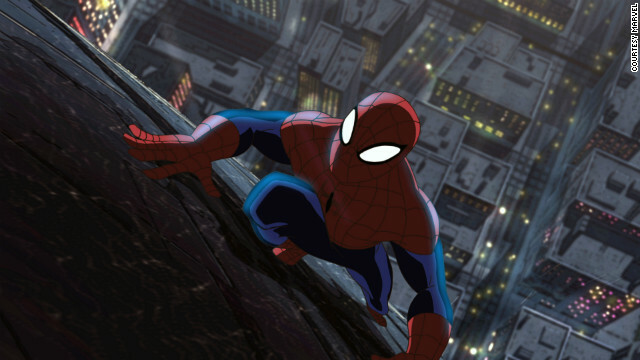 As in this summer’s feature film, Parker is in high school, but “Ultimate Spider-Man” doesn’t dwell on his origin story or his adjustment to becoming a superhero. The show incorporates plenty of Spider-Man’s trademark one-liners, plus abrupt shifts in animation style and fourth wall-breaking. Accompanying “Ultimate Spider-Man” and “The Avengers” in Marvel/Disney XD’s programming block are short video dossiers of other Marvel characters, an exploration of the technology required to make superheroics a reality, and a behind-the-scenes look at stunts, special effects and the artistic process of bringing characters to the screen. In the 2008 spoof film “Superhero Movie,” he played Rick Riker, a teenager who gains superpowers after being bitten by a genetically altered dragonfly during a school trip. Quesada said Bell brought the necessary comic chops to the part, as well as the ability to convey “the Peter Parker lot.” No matter how hard he tries to do the right thing, something eventually goes wrong. I've been perusing the used book setors trying to get the old Ultimate Universe stuff, got my hands on all of X-Men and Fantastic Four, but I really cant find any of the old Ultimate Spider-Man stuff. I want to get caught up with the Ultimate universe, because I am previously only familiar with The Ultimates. Wow, marvelous weblog structure! How long have you been running a blog for? you make blogging glance easy. The entire glance of your website is magnificent, as neatly as the content material! All the good recent Marvel shows never stay on long. Spectacular Spider-Man was good. The Iron Man show I thought was pretty cool with the young Tony Stark. Wolverine & The X-men was just awesome from beginning to end. I was ready for Season 2, but it got canned. I will support this show as much as I can, but it may meet the same fate. This looks interesting and I'll definitely watch it, but I really wish they hadn't cancelled Spectacular Spider-Man. Also this show is following Peter Parker, not Miles Morales. Morales is staying in the comic world for now.